On this date* in 1764, one of history’s greatest monarchs cemented her still-uncertain hold on power by beheading a rebellious lieutenant. Ivan VI: Born under a bad tsar. Succession in the Russian Empire had been disputatious ever since Peter the Great killed off his last male son, eventually putting far-flung branches of the family into a contest for power. To skip over much regal jockeying, Peter’s vicious niece Anna, who reigned in the 1730s, had installed her infant nephew Ivan VI as successor just before her own death. 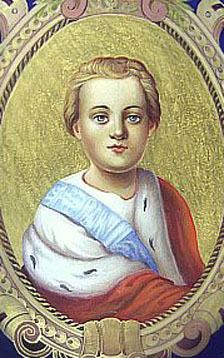 The little Tsar of All the Russias was displaced before his second birthday by Peter the Great’s daughter Elizabeth, who clapped the former emperor in a dungeon in Schlusselburg fortress to grow up ignorant and alone, isolated from the parties who might scheme to bid for power in his name. Two Caesars are too many. Into this dangerous scene stepped Sophia Augusta Frederica, better known to posterity by the name she took upon her politically savvy conversion to Orthodoxy: Catherine. This Catherine immigrated to wed Elizabeth’s simpleminded heir, then overthrew him a few months into his reign. Catherine had ultimate power, but she wasn’t yet “Catherine the Great”: as a foreigner with the late Romanov’s blood on her hands (if only indirectly), it was nowhere written that she would rule Russia for 34 brilliant years. And with the throne came its rival claimants … like Ivan, now an adult and potentially more “legitimate” than this imported German princess. Ivan was held in secrecy, known only as “Nameless Prisoner Number One”, and his warders had strict orders to murder him on the spot if any attempt were made to liberate him. Two years into Catherine’s reign, Lt. Vasily Mirovich, “a tormented young officer … with dreams of restoring his family’s fortunes,” attempted just that. As commanded, the guards put an end to Ivan’s troubles. Mirovich was executed in St. Petersburg. When his head was held up to the crowd, it had a terrifying impact, the death penalty not actually having been exercised in Russia for 22 years. ** Mirovich himself faced his execution calmly, convincing some of the bystanders that he was expecting to be pardoned at the last minute. His remains were left on public display until the evening, when they were burnt along with the gallows. And so the first two years of the reign of Catherine II, who set so much store by reason and enlightened principles, had included two assassinations and an execution. The woman of letters, the correspondent of philosophers, the Semiramis of the North … like the age’s other great enlightened despot, Frederick the Great, Catherine had to rule. She had not the luxury to dispense with statecraft’s cruel necessities. Her admirers would have to be content with making her excuses. Fortunately, admirers always are. * September 26 (pdf) was the date on the Gregorian calendar then prevalent in Europe; it was September 15 by the older Julian calendar still used in Russia at the time. ** Not carrying out the death penalty had been a signature policy of Ivan’s usurper Elizabeth. The elimination of capital punishment in “backwards” Russia for an entire generation during the Age of Absolutism surely urges caution against any assumption that death penalty repeal is a one-way street.